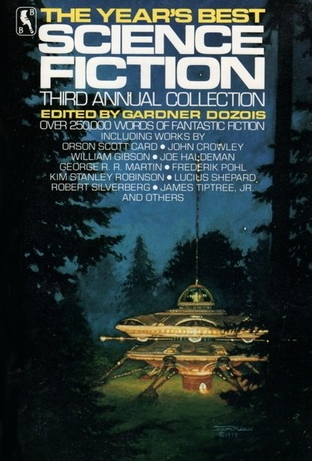 Dozois also edited what may be the single most important anthology in my life: The Year's Best Science Fiction, Third Annual Collection, which I got from the Science Fiction Book Club when I signed up, roughly around the time I started submitting to Asimov's. The local grocery store carried Analog, not Asimov's, and since it wasn't expensive, my mother would buy me the new copy to keep me from being too much of a pain during grocery shopping. (Or Twilight Zone or Omni, the other magazines at the store that held my interest.) It was Tom Easton's review of the Third Annual that made me decide to include it among the books I got on signing up for the SFBC — I remember what he said in the review, that there were now a number of "Year's Best" anthologies, but this one was "the one to get if you're getting only one". I didn't have the money to get more than one, and ultimately could only get this one because of the SFBC's introductory offer (10 books for $1 or something like that). Looking at the table of contents now, I'm astounded: James Tiptree and Lucius Shepard — Frederick Pohl and Pat Cadigan — Bruce Sterling, R.A. Lafferty, Howard Waldrop, John Crowley — writer after writer whose work would challenge and inspire me for decades to come. And "Solstice" by James Patrick Kelly. I've told the tale of this book and that writer and me before. Though Jim has published all sorts of stories since "Solstice", none could ever mean as much to me. 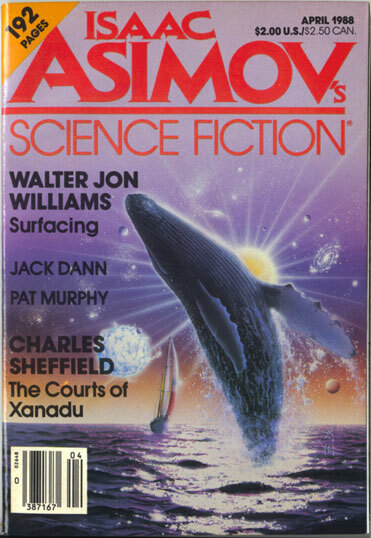 That year, for Christmas my parents gave me a subscription to Asimov's, which I probably said was the only thing I wanted, and I was probably speaking truthfully. (Analog bored me, but the issues of Asimov's I'd borrowed from my mother's boss had captured me imagination, and also often perplexed me, but in a good way.) April 1988 was the first issue that showed up in the mailbox. The first issue that I didn't have to give back to its rightful owner. I still have it. Just touching it is perhaps the most nostalgic sensual experience I have: the quality of the cover, the feel of the thin pages, particularly as they flip through your hand. 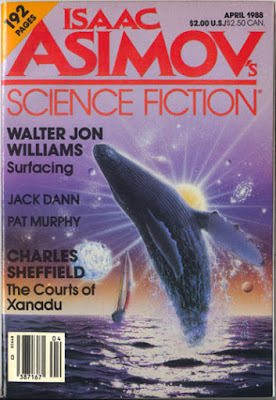 That beautiful cover by Hisaki Yasuda, illustrating "Surfacing" by Walter Jon Williams, a story I remember being captivated by. Eventually, I got the earlier 1988 issues, and many others, at used bookstores. Through numerous moves, I've kept my old Asimov's, a complete run from about 1984 through about 1993 or 1994. They shaped so much of my taste in short fiction especially that to give them away or sell them would feel like losing some part of my self in a way that getting rid of little else would. I saved up money every year to buy Dozois's annual year's best collections. I didn't stay with SFBC long, so all my subsequent editions came from bookstores. I missed the Fourth Annual, picking it up some years later at Avenue Victor Hugo Bookstore in Boston, but I found the Fifth Annual at the little bookstore in town. By that time, I had a summer job, and if having a summer job wasn't to help buy wonderful books, I didn't know what it was for. (My parents likely disagreed.) The heft of the book was what got me. The Third Annual in its SFBC edition is a bit shrunken, its paper thin and its general size smaller than the trade editions. It feels compact, whereas the trade paperback I got of the Fifth is a proper doorstop. I kept reading Asimov's and Dozois's Year's Bests throughout high school, and can think now of so many great reading experiences they both provided. For instance, Dozois published a couple of early stories by Jeff VanderMeer. I'd previously had some contact with Jeff when I submitted to his little magazine Jabberwocky, information about which I'd found in Writer's Digest, which I read with great seriousness at the library every month. Jeff was one of the first people ever to respond with a personal rejection, and we both tried to sound older than we were. I felt fondness for him because of that, but I must confess I thought (for various reasons I don't need to go into here) he might be some sort of crazed maniac living in a basement, and so I've never forgotten my amazement when I saw his name in my favorite magazine: "Ohmygawd," I thought, "he's actually a real writer!" In college, I stopped reading Asimov's, let my subscription go, didn't keep up with the Year's Bests. Both I and, in many ways, Dozois had moved on, changed, shifted. I spent most of the 1990s working to become a playwright, and when I wasn't reading stuff for college, I was usually reading plays. But when I did read fiction, I wanted something different from what I was getting from the standard sources. I discovered Crank and Century, predecessors to what would be a flowering in the early 2000s of work indifferent, and even openly hostile, to decrees of genre boundaries. Dozois never showed interest in avant-garde fiction, at least to my knowledge, but in his early years at Asimov's and in the late-'80s/early-'90s Year's Bests he published quite a bit of work that pushed against various borders and walls, especially the expectations of genre readers about what SF could and, indeed, should be. His was a pluralistic, ecumenical, eclectic vision of the field, one gained from coming up as a writer himself in the years after the New Wave had shaken things up a bit. He loved a good space opera, but he was just as much a champion of "The Faithful Companion at Forty", the sort of story that less open-minded readers said didn't belong in a science fiction magazine. After the 1990s, I can't say I followed Dozois's work closely, and I never had a commitment to SF as a field in the way he did, nor did we ever meet or correspond with each other, but I always felt fondly toward him, because there's probably no other person who so deeply shaped my sense of the possibilities — and joys — of literature. That I am far from alone in such a feeling is one of the many testaments to his importance, and one small measure of the giant loss his death creates.